For this tag you will want to get this amazing looking male tube by Freya Langford-Sidebottom which can currently be purchased at Artistically Inclined Licensing. You must have a license to use art from AIL. 1. Open new canvas sized at 800 x 800 and drag and drop tube of choice into canvas, delete all layers except 10, 5 and 6. Slide the opacity over to 100 on layer 5.
place both of the white branches over the green branch and merge all 3 layers together then move down below the frame layer in layers box, duplicate and move below the other branch also rotate by -15 degrees. Merge these two layers together. Duplicate and flip to other side of frame. Merge again. Duplicate again. Merge again and duplicate once more. Really want to fluff this area out with foliage. Click inside the frame with the fuzzy select tool, SELECT>GROW by 4 then SELECT>INVERT and make sure the green and white branches layer is the active layer aka selected in layers box, go to EDIT>CLEAR. 3. Position tube layers with the layer named 6, the close up, go to COLORS>DESATURATE then up to MODE in layers box and choose HARD LIGHT. Again you will want to crop this layer as you did the branches and papers above... click inside the frame with the fuzzy select tool, SELECT>GROW by 4 then SELECT>INVERT activate close up tube layer in layers box and EDIT>CLEAR. At this time make sure that the copyright info to this tube is clearly displayed. 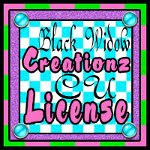 Include copyright symbol, artist's name, website and your license number if applicable. If you want to use the one it comes with, that is fine also. 4. Add a drop shadow to ALL elements except the branches and snowflakes at the back of the tag. Just go to FILTERS>LIGHT & SHADOW>DROP SHADOW with settings at 2/2/15 on frame and tube but 3/3/6 on all others. 5. Drag and drop the mask into the canvas and scale to 772 x 846. Go to COLORS>INVERT and LAYER>TRANSPARENCY>COLOR TO ALPHA, then right click on it in layers box and choose ALPHA TO SELECTION then up to SELECT>INVERT and make sure paper 3 layer is activated in layers box and go to EDIT>CLEAR. The paper should now be the mask. You can delete the original mask layer now. 6. I used a font called RifrafScriptSSK Bold in white then right clicked on text layer in layers box, ALPHA TO SELECTION, up to SELCT>GROW by 2 and add a new transparent layer, in which you will want to use the gradient fill tool and pic your foreground layer green and background layer red. Click and drag upwards within the new layer. Add noise by going to FILTERS>NOISE>RGB NOISE with correlated the only box checked and levels at 20/20/20/0. Add drop shadow with same settings as used previously.